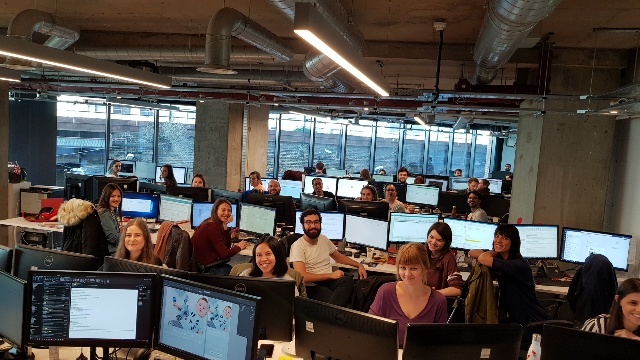 Codex has moved to a brand-new office in the Nine Elms International Quarter, at the heart of London’s newest and largest regeneration zone. The office is adjacent to the forthcoming Nine Elms tube station and benefits from easy access to Vauxhall’s underground, overland and bus terminal with the Thames Clipper service just 10 minutes walk away. 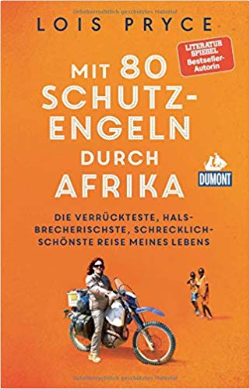 Codex Global, MairDumont, linguists Anja Fülle and Jérôme Mermod recently collaborated on the translation of a new book Red Tapes And White Knuckles (German title: Mit 80 Schutzengeln durch Afrika) (https://shop.dumontreise.de/mit-80-schutzengeln-durch-afrika-9783770166879), an account on a woman’s motorcycle adventure through Africa. 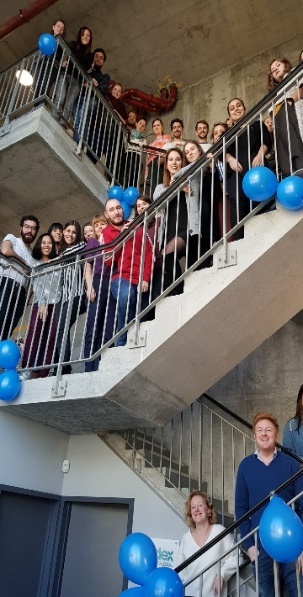 Once again Codex is delighted welcome a host of new starters to our business this month, our new recruits have join us from Holland, Germany, Italy, and Brazil. In an extension of the management team, Iris Van Oudvorst has been recruited to the role of Client Services Manager which reflects a year of significant growth and on boarding of a number of large new international clients. 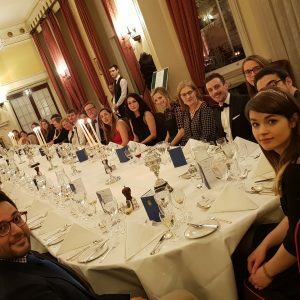 On Wednesday 24 January 2018, Codex honoured the life and poetry of Robbie Burns with a traditional Burns supper at The Cavalry and Guards Club – this formal event marked the culmination of a significant year of growth for the business in 2017, the celebrating of our 15th birthday and the presentation of the annual awards. Having piped in the haggis and addressed it in customary style a great dinner was had by all in the wonderful setting of the Cavalry Club. Awards were presented to Team Wild Fire, Joao, Erik, Mirella and Matt – congratulations to you all. On Tuesday 7 November 2017 Ksenia Ivanova and Mirella Pascu from Codex Global were visiting lecturers at The London Metropolitan University department of translation and interpreting. Ksenia and Mirela presented the students with an overview of the employment opportunities with a Language Service Supplier (LSP). They presented the routes to employment, gave an overview of the roles available in the sector, outlined the details of the well-regarded Codex internship scheme and recounted some personal anecdotes and advice. 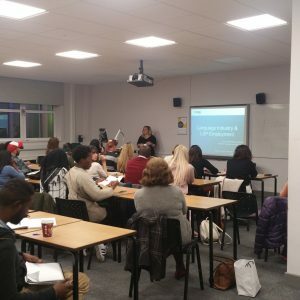 The lecture was over subscribed by students and the informal Q&A session was detailed and informative, next time Maite Gonzalez FHEA, Senior Lecturer in Languages (Translation), BA and MA Translation Work Placement Coordinator London Met has agreed to allocate additional time. Many thanks to London Met for entertaining Codex, we are proud of our relationship with the University, many of their former students are now Codex employees. For more information on opportunities at Codex contact HR@codexglobal.net. 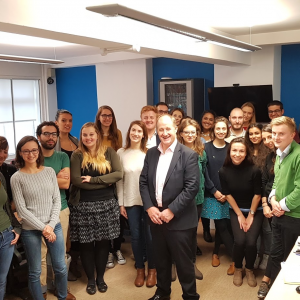 On Wednesday 18 October 2017 we were honoured to host Kevin Hollinrake MP in our London office. Mr Hollinrake was briefed by the Codex management team on the history of the business, it’s current vital statistics, the Codex service offering, our clients and an analysis of our geographical and sector activities. Following the briefing, Rupert Foster the Codex MD introduced Mr Hollinrake to the team, he spoke to several employees from Europe and then addressed the whole office. Mr Hollinrake’s speech focused on concerns raised by the team on the impact of Brexit, his thoughts on the future of UK businesses trading with Europe and the rest of the world and he concluded by saying:….”how encouraging it was to visit Codex, a company founded in Yorkshire, now head quartered in London, staffed with international employees and growing its customer base in UK, Europe and beyond”. Many thanks for coming Kevin, we will remain in touch. We are delighted welcome a host of new starters to our business this month, in keeping with our industry sector our new recruits have come from Ireland, Poland, Italy, Spain and Scotland. George Mackenzie Smith our new sales executive has taken a particularly convoluted route from Perthshire! 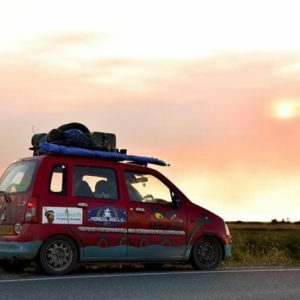 He and his Kilted and Klueless team have driven 16,000 kilometres to Ulan Ude (Mongolia) in a particularly battered Vauxhall Agila. Along the way they have raised a cool £8,675.00 for Maggie’s Centres a charity that offers practical and emotional support to people affected by cancer. 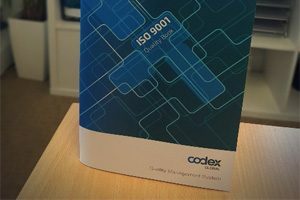 In January 2017, Codex was successfully recertified to ISO 9001: 2015 on Quality Management Systems, one of the key standards for the language services sector. Moving on from our previous certification ISO 9001: 2008, Codex has retained its full scope of certification on language services including translation, website and software localisation, multilingual desktop publishing and interpreting. Our Quality Management System also incorporates ISO 17100 on Translation Services (previously BS EN 15038) and Codex remains compliant to its best practices. 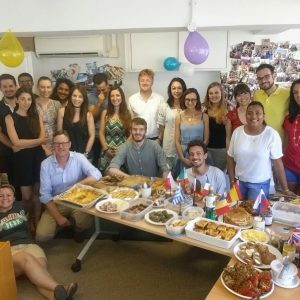 For the second year in a row, Codex has held an international lunch party. This year we had dishes from all nations represented by the team. Thanks to everyone who participated – let us know if you would like to come next year! We are delighted to report that our daredevil and adventurous production manager David Dieguez is back at his desk in London! 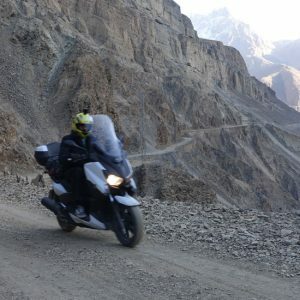 David has just completed his 6-month sabbatical during which time he travelled 25,000 miles from London to Mumbai on his Yamaha Xmax 125cc scooter. 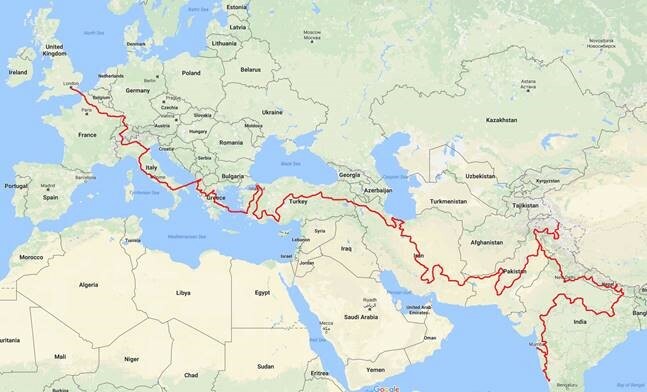 David’s route took in France, Germany, Switzerland, Italy, Albania, Greece, Turkey, Iran, Pakistan, India and Nepal. His stories of cultural diversity, wealth, poverty and hospitality are extraordinary.